A meeting was held between a visiting EU mission on labour rights and BGMEA leaders in recently. The meeting was organised to discuss the most recent developments, in particular as regards the progress on the reforms that were announced on the 4th Sustainability Compact meeting held in Brussels in June 2018. The BGMEA President Md. Siddiqur Rahman informed the EU mission that Bangladesh has achieved significant progress in the areas of workplace safety and workers’ rights since the adoption of the Sustainability Compact. He also apprised them of the initiatives already taken and the ongoing efforts for ensuring the rights and welfare of the garment workers in Bangladesh. The EU mission included Nikolaos Zaimis, Adviser, Sustainable Development; Economic Partnership Agreements – Africa, Caribbean and Asia Pacific; Lluis Prats, Head of Unit, Labour Mobility – International Issues; Isabelle Delattre, Deputy Head of Division, Regional Affairs and Relations with Asia Pacific and South Asia; Elina Laurinen, Policy Officer, Co-ordinator for bilateral trade and investment relations with countries in South Asia; Maja-Alexandra Dittel, Policy Officer, Generalised Scheme of Preferences (GSP); and Benedikt Buenker, Policy Officer, Labour Mobility – International Issues. 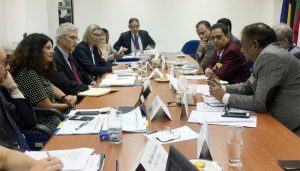 EU Ambassador and the Head of Delegation to Bangladesh Rensje Teerink were present at the meeting. FBCCI President and former BGMEA President Md. Shafiul Islam (Mohiuddin), BGMEA Vice President Mahmud Hasan Khan (Babu) and BGMEA Directors Md. Rezwan Selim and ANM Saifuddin also took part in the meeting.